Babyologists, you certainly know what you like when you see it! The twin cot from Mini Meise that we featured in our Kind + Jugend roundup caused quite a stir, not only amongst parents of twins but for families with siblings close in age. If you thought the twin cot was fabulous, wait until you see the rest of the superb Mini Meise collection. Clever styling and furniture pieces that can be reconfigured and adapted to suit different rooms give the Mini Meise collection great versatility. For example, the room below seamlessly integrates the ‘nursery’ and the master bedroom. 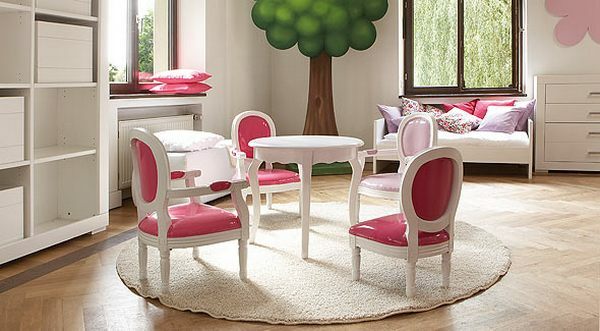 That said, there are lots of pieces to thrill little kids – animal motifs, canopy beds and splashes of watermelon, pale pink and turquoise set Mini Meise apart. Personally, I think the ‘piece de resistance’ is the pint-sized Louis XIV chair, given a modern twist with shiny pink upholstery. A matching table is available and against the backdrop of the sleek, modern shapes of the rest of the Mini Meise collection, the effect is sensational. We hate to tease our readers with fabulous finds only to reveal that actually buying what we have featured is near impossible – alas, such is the case with Mini Meise. The only online retailer of Mini Meise that we discovered delivers within Germany only. For interest sake, the twin cot is priced at €829 (shown below).